The Frost Museum of Science opened its new facility in 2017 on the Miami waterfront. Two Lift solar "trees" on its front porch viscerally communicate both the unique interactivity of Frost and its commitment to sustainability. And it does not disappoint. Thanks to a donation from Florida Power & Light, this stunning LEED Gold certified building has both rooftop solar and sculptural solar, in addition to many other sustainability measures. It uses advanced clean technologies in a way that engages people. 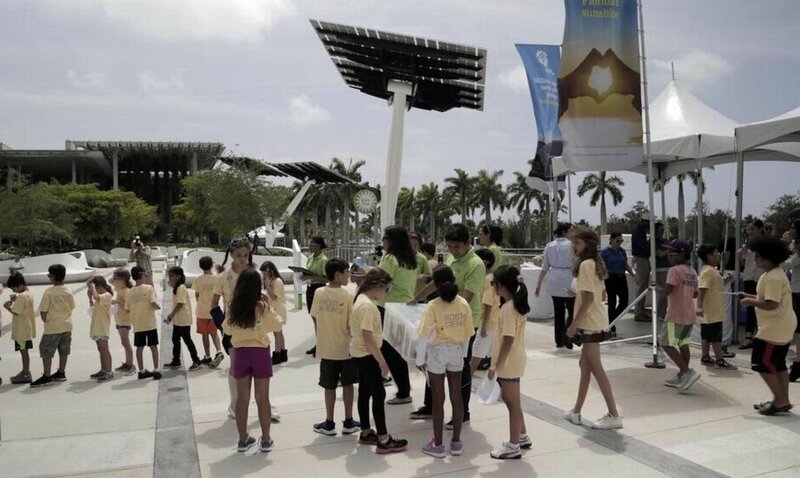 Educational programs called Days In The Sun provide kids hands-on experimentation with solar energy, right in the shade of Spotlight's memorable solar structures. On the rooftop there are 240 solar panels - enough to power 66 South Florida classrooms. This echoes the other 10 million solar panels FPL is installing in larger solar farms. Frost is a leading science museum dedicated to sharing the power of science, sparking wonder and investigation, and fueling innovation for the future. About one million visitors per year explore the world of science, technology, engineering and math (STEM) in an experiential setting.